In 2009 as part of my masters coursework I had to create an e-learning intervention for my online learning design course. As I was working in supporting academics share teaching materials as open educational resources, I thought I would create a website in our learning management system (based on SAKAI, project name Vula) to support academics through this process. I created the site using the Vula wiki tool, which enables one to combine text, images, and other media and create structured pages. It was much like creating a portfolio of my work with the presentation handled by the wiki tool. The e-intervention was quite a success and although it never went live or was used by academics on mass, it did turn out to be an important demonstration of my ability to create e-learning material. As my studentship at UCT is now ending, I decided that I wanted to export the content from Vula and put it another space online which I could manage and access for the rest of my life. The portability of the resources one creates in university is increasingly important. As I will soon lose access to the sites that I have had access to in the learning management system, I have begun backing up and archiving all of the documents, interactions, and other stored media which these sites entail. It would be great if students at UCT could have access to their Vula sites for life, yet this creates an issue for the folks who support the learning management system in terms of providing accessibility and total data storage. Since we have been exploring Wikispaces as an e-portfolio tool, I decided to export the contents of the SAKAI wiki to Wikispaces. I managed to copy most of the text directly from the SAKAI wiki to Wikispaces and most of the formatting, colours and layout were maintained. I did have to reupload all of my images to Wikispaces as the Vula wiki image links do not use absolute link references. Overall, the migration of a SAKAI wiki to Wikispaces was pretty easy and only took an afternoon to migrate the 6 pages. Wikispaces also allows me to embed Youtube video and Slideshare presentations in the Wiki. This was really nice as the SAKAI wiki did not allow embedded content and could only handle links to those sites. 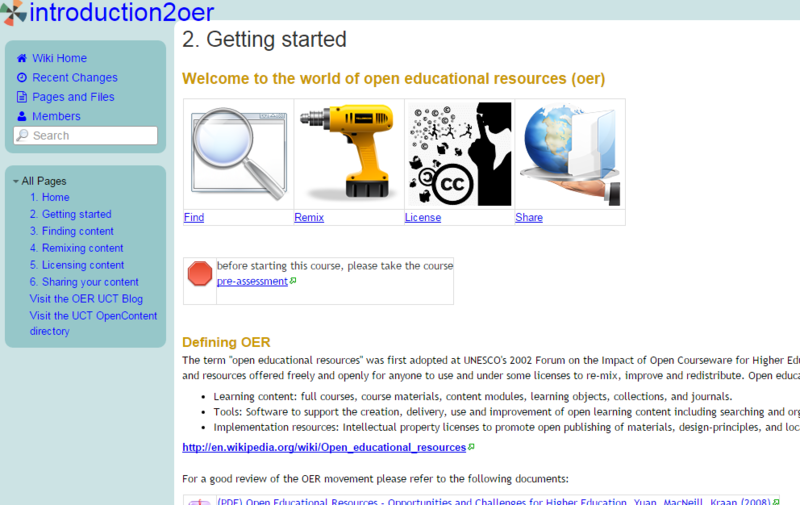 You can access my new Wikispaces wiki on creating open educational resources here. Porting a Sakai Wiki to Wikispaces by Michael Paskevicius is licensed under a Creative Commons Attribution 4.0 International License.